In an alternate reality, the Justice League is considered a group of terrorists who are not only feared by evildoers, but also the entire population at large. Wonder Woman is a New God who fled to Earth after Darkseid’s entire family was killed on her wedding day. Superman’s a short-tempered bully, traits possibly passed down from his father, General Zod. And Batman is actually a vampire, the side effects of an experimental drug gone horribly wrong. 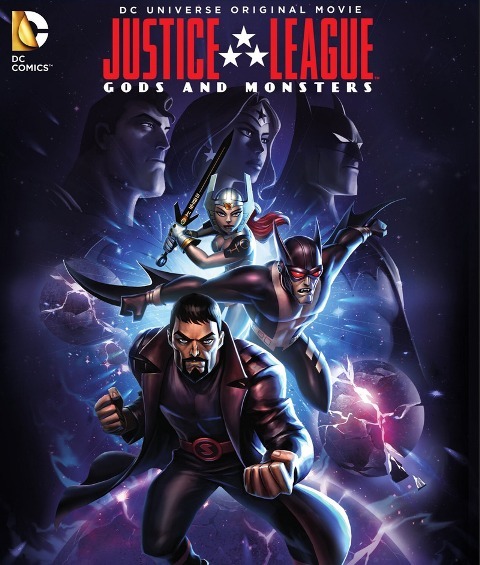 Justice League: Gods and Monsters begins with the arrival of a mysterious creature that kills multiple scientists, many of whom worked on a top-secret government project together. Someone is trying to frame each one of the superheroes, as public mistrust of them is at an all-time high. Project Fair Play could spell doom for everyone involved. As the movie progresses, the backstory of each main character is revealed. This version of Superman is literally an illegal alien, as the other-worldly baby is taken in by migrant farmers, Wonder Woman is quite handy with a sword and Batman is a lab rat. Lois Lane is unrecognizable and this version of Lex Luthor craves knowledge, but not power. Overall, Gods and Monsters offers a cool what-if scenario that peeks into a parallel world, one with a radical version of the DC Trinity. Blood is shed, drunk characters are shown and curse words are spoken… this movie is definitely not intended for children. While we prefer adult-themed Justice League stories, we’re just not really fans of animated characters using foul language. Make sure to check out the preview to the upcoming animated movie, Batman: Bad Blood, which is also included on the disk. If you don’t mind witnessing a departure from DC’s classic characters, Gods and Monsters isn’t the worst DC Universe Animated Original Movie out there. Don’t expect Tim Daly and Kevin Conroy to voice Superman and Batman, as the voice talent is also all new. In an odd twist, the new Superman voice actor (Benjamin Bratt) actually sounds a bit like Kevin Conroy’s Batman, which is odd, to say the least. Strength: A new Justice League, original story and all sorts of anger-fueled action. Weakness: These are definitely not the DC comic-book characters you grew up with. WTF Moment: In a role reversal, Luthor gives Superman the opportunity to become an actual hero (with the help of Kryptonian science).